Currently accepting submissions for the 2020 issue. Baltimore Weddings is looking for exceptional photography of diverse local weddings in Baltimore, Central MD and the Eastern Shore (no DC, Prince George’s or Montgomery county weddings). This is your opportunity to showcase your talent to 25,000 brides-to-be, both in-print and online. We look for a comprehensive collection of images that tell the entire wedding story—candids and posed shots, as well as details. Selections for print publications will occur within 3-4 weeks of the submission deadlines listed below. Photographers and the happy couple will be notified if selected. Weddings of the Month online features will be selected throughout the year. Weddings chosen for publication may also be considered for the magazine cover. Weddings not chosen for print features will be considered for online features and/or other editorial content. Illustrations by Anchor Point Paper Co.
Do submit via the Wedding Submission Form. To be considered, all submissions must be submitted via the online Wedding Submission Form. If an email is required to share files or downloadable galleries please use: lstaci@baltimoremagazine.net. Do submit 75-150 images from your wedding. Don’t submit the entire wedding. Please only submit 75-150 high-resolution non-watermarked images per wedding. Don’t worry, if we think we need more, we’ll ask! Please include all aspects of the wedding: getting ready, portraits, ceremony, reception, and details. Especially the details. Do submit links to file sharing or downloadable image galleries. Don’t submit an online gallery or blog post. Dropbox, Hightail, or other file sharing programs are preferred. Please share the downloadable link versus the folder. Any contents in a ‘shared’ folder in Dropbox will be copied and deleted for space. If you are submitting images through PASS or other online client galleries, it must include a folder of highlights or favorites for submission. Images must be downloadable. Don’t forget to include any PINs or necessary passwords. Do submit high resolution ready-to-print images that can be downloaded. Don’t submit lo-res, watermarked images, or images that can only be viewed online. We won’t be able to choose your wedding if we can’t download it. And we can’t publish your wedding if the photographs are low resolution or watermarked in any way. Weddings that have occurred between September 2018 and August 2019. Published January & July 2020. If you have already submitted for consideration for the 2018 Local Love supplement issue, you do not need to resubmit. Selection notifications will occur by end of September. 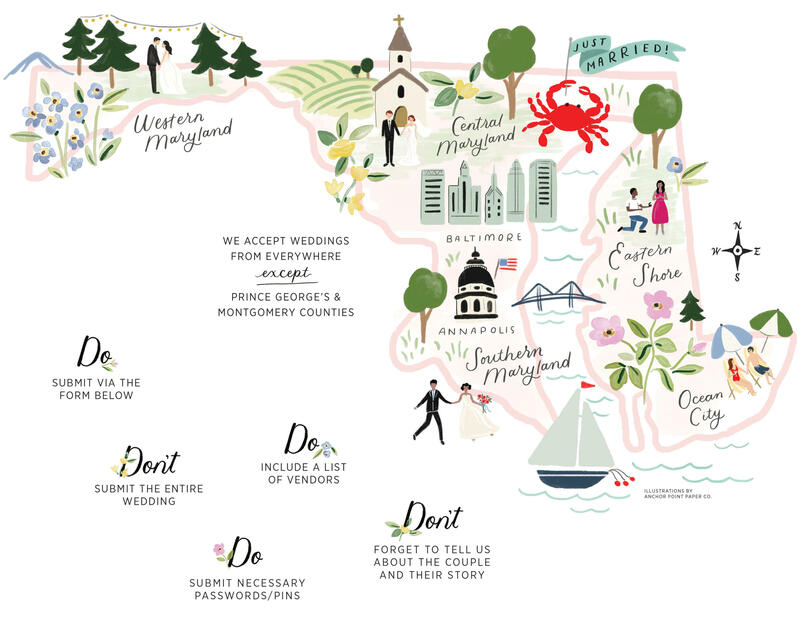 For the Local Love supplement of Baltimore Weddings featured in Baltimore magazine’s June 2020 issue Weddings that have occurred between January 2019 and February 2020. Published in the June 2020 issue of Baltimore magazine. If you have already submitted for consideration for the 2020 issue, you do not need to resubmit. Selection notifications will occur in early March. Print features are exclusive to Baltimore Weddings—the wedding cannot have run with any other media outlet in order to run in the print magazine. Submission does not guarantee publication in the magazine or online, and publication will be determined by editorial discretion. An editor will be in touch if your photos are chosen for publication, and by agreeing to have the photos or work published, you and the agreeing couple featured grant Baltimore (and thereby Baltimore Weddings) permission to use the photos on our network of pages and publications, including but not limited to Baltimore, Baltimore Weddings, baltimoreweds.com, baltimoremagazine.com, Baltimore and Baltimore Weddings’ Facebook Page, Baltimore and Baltimore Weddings’ Instagram Page, Baltimore and Baltimore Weddings’ Pinterest Page, and Baltimore and Weddings’ Twitter page.